The endless fight between Republicans and Democrats seemed to pause last week. 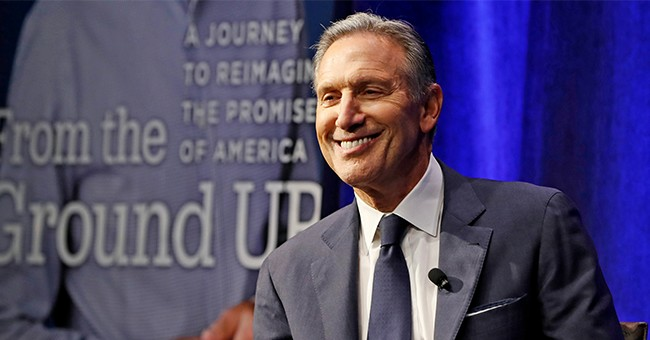 The cause: former Starbucks CEO Howard Schultz's announcement on "60 Minutes" on Jan. 27 that he is seriously considering a 2020 run for president as a centrist independent. Social media and partisan opinion writers lost their collective minds on that possibility, one of the parties seemingly deploying an activist to disrupt his first public outing, a New York City book event. "Don't help elect Trump, you egotistical billionaire a--hole," the heckler yelled. "Go back to getting ratio'ed on Twitter. Go back to Davos with the other billionaire elites who think they know how to run the world." The president had his own opinion on a Schultz run, tweeting: "Howard Schultz doesn't have the 'guts' to run for President! Watched him on @60Minutes last night and I agree with him that he is not the 'smartest person.' Besides, America already has that! I only hope that Starbucks is still paying me their rent in Trump Tower!" The headlines from major newspapers and digital news publications were equally unkind. "Schultz Is the Answer No One Is Looking for" was the CNN headline. Vox went with "Dear Billionaires: Stop Running for President." When "Morning Joe" co-host Mika Brzezinski asked Schultz whether he knows the price of Cheerios, it became a Twitter thing for hours. The question is: Why the freakout? A Pew survey on political ideology last November showed overall Americans place themselves close to the midpoint on the ideological scale. Why would someone running as a centrist get so much guff? Easy, said Michael Wear, a Democrat who worked on the White House faith-based initiative during President Barack Obama's first term and directed faith outreach for his 2012 re-election campaign. "I think their position against him goes especially to the early part of the primary process, which is tailored to activists and donors rather than voters, so as someone outside of the party system, they can expose all of those weakness," he said. "And they can also expose all of the room in the middle, because they are trying to win campaigns on how awful the other candidate is." In short, a Schultz run or any other independent run will expose how the partisan game is played and how much voters' concerns are ignored in favor of donors' and activists'. Neither party wants to reveal that it wants to avoid the middle to win the primary, and you can't win a primary without throwing red meat to the activists and the donors. An independent centrist like Schultz wouldn't face the scrutiny of a competitive primary race, said Wear. "That is why I am cold on independent candidacies, especially in an election that is going to be this important." But that does not mean centrist Democrats shouldn't run. "Of course, there is room for a centrist, and I hope that more centrists run in the Democratic Party," he said, "someone who puts forward an active vision of how government could help those in need, and the crisis we face in economics and climate change, and presses the pause button on the culture wars." "This is where I think there is an opportunity for someone who would tone down the vitriol in politics and have an active vision to bring us together," said Wear. "I think of Michael Bennet, Mitch Landrieu, John Bel Edwards, or Amy Klobuchar," the Colorado senator, former New Orleans mayor, Louisiana governor and Minnesota senator, respectively. Every overreaction in American politics tends to be about one of the two parties' vulnerabilities. An independent candidate like Schultz hits both establishment parties' weaknesses; they care more about their donors and their activists than the majority of the people in this country, who is just looking for competent leadership.